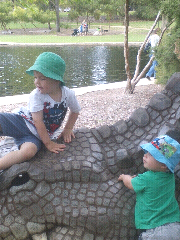 Enjoying a lovely Sunday in Perth with my gorgeous grandsons !!!! No time for stitching as yet lol! Plenty of time to stitch, just enjoy our grandchildren, ps u are too young for grandchildren by the wat! Oops sorry couple of typos there! Stitching will keep, enjoy those little fellows while you can. So Cute!!! Enjoy every moment! !